We’re well into 2013 publishing news season so let’s just get on it, okay? A 1973-74 classic from a manga master. This (very) free adaptation of the novel employs a range surrealist, collage-like techniques that engag with contemporary Pop Art and psychedelia, as well as Japan’s modern history of cultural appropriation, to bring to life the great American story. It features combines Sugiura’s signature brand of absurd action and exquisite drawing, veering constantly from lowbrow cartoon spoof to nuanced meditation on American cultural influence. 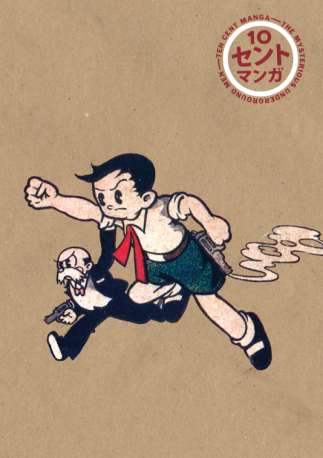 While Tezuka Osamu’s New Treasure Island (1946-47) was the first major hit for the “god of manga,” the artist himself regarded a later book the first of his signature “story manga.” Originally published in Osaka in 1948, The Mysterious Underground Men tells the story of Mimio the talking rabbit, as he struggles to prove his humanity while helping his friends save earth from an invasion of angry humanoid ants. Inspired by Bernhard Kellermann’s Der Tunnel (1913) and drawing widely on European and American science fiction, as well as Milt Gross’ own pioneering “graphic novel,” He Done Her Wrong (1930), this full-color edition ofThe Mysterious Underground Men will not only introduce to English-language readers a founding monument in modern Japanese comics. It will also offer a rare glimpse at the wide-ranging Western cultural sources that made up young Tezuka’s world. The manga “boom” may have faded, but the ongoing flow of historical and literary manga from art comics publishers is a welcome evolution.